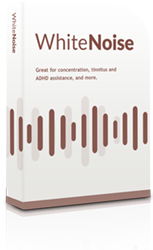 White Noise MP3 Audio Downloads | Mask Noise and Improve Focus! Our signature recording! 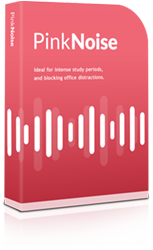 Great for enhancing focus, reducing tinnitus noise, and eliminating distractions. Warm and relaxing. Perfect for undisturbed sleep, physical/mental relaxation, and quiet focused reading. Discover Powerful "White Noise" Recordings! Imagine listening to a SPECIAL SOUND that could block out ALL background noise. Within seconds of listening, your whole world seems quieter and calmer. Your productivity soars, as your concentration sharpens. If listening in bed, you find it easier to go to sleep, as all noise distractions are eliminated. Problems such as tinnitus and ADHD start to gently simmer away. This is the scientifically-validated world of White Noise. You might have heard of "White Noise" before. It's a special sort of sound, which blocks out background noise and helps boost concentration levels. It also has two close relatives - Pink Noise and Brown Noise. Each achieves the same goal, yet they sound slightly different. White Noise sounds more like TV static, Pink Noise sounds more like a natural waterfall, and Brown Noise sounds like low-pitched, ocean wind. All colour noises are computer-generated to a specific mathematical model, to ensure they operate at their most effective. Learn more about the science behind White, Pink and Brown Noise. You have to immerse yourself in these sounds to truly witness how powerful they can be. They're so good at helping you concentrate, you won't want to work without them! Noise Colors.com produces a range of special audio recordings, covering White, Pink and Brown Noise. These are all available on CD or as instant MP3 downloads. Remember, all of the different "colors" of noise produce the same results - blocking out background sounds, boosting concentration, and helping you get to sleep. It all depends on which sounds you find most comfortable for different applications. Our signature White Noise recording. This audio is rich with a gentle, static-like noise that covers the entire audio spectrum - blocking out all background noise. Great for enhanced focus, tinnitus and ADHD assistance, eliminating background noise distractions, and more. Pink Noise has a deeper frequency than White. It sounds like a natural waterfall. It's ideal for increasing concentration, intense study periods, soothing headaches and calming children. Brown Noise has the deepest frequency. It sounds warm and relaxing, with its low-pitched sea-like sound. For this reason, it's particularly suited for deep sleep, relaxation, and quiet focused reading. In association with Sonic Vitamins.